Meghan Alexander was born and raised in Austin, Texas and has been practicing law since 2007. Upon graduating from Texas Tech University School of Law in 2007, Meghan served for three years as an Assistant District Attorney in the Civil Division of the Lubbock County District Attorney’s Office. 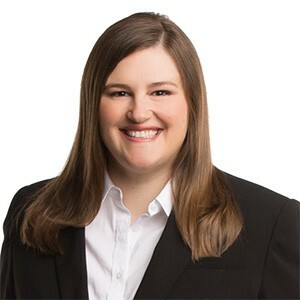 Meghan has represented clients in many areas, including general litigation, real estate, deceptive trade practices, employment law, adoptions, and estate planning. Meghan has participated in over 150 mediations, over 300 bench trials, and several jury trials. During her years of practice, she has gained valuable experience resolving disputes and advocating for clients in and out of the courtroom. She excels at helping clients find business solutions through cost benefit analysis and smart strategies that get our clients out of the courtroom and back to doing what they do best. In her free time, Meghan enjoys spending time with her partner Amanda and their son, Lincoln. Obtained summary judgment for defendant sellers, real estate agents, and broker in a square footage dispute case. Awarded $157,000.00 in attorneys’ fees. Represents adoptive parents in uncontested adoptions. *CV, BV and AV are registered certification marks of Reed Elsevier Properties, Inc., used in accordance with the Martindale-Hubbell certification procedures, standards and policies. Martindale-Hubbell is the facilitator of a peer review rating process. Ratings reflect the confidential opinions of members of the Bar and the Judiciary. Martindale-Hubbell Ratings fall into two categories - legal ability and general ethical standards. This web site is intended for informational purposes only and should not be construed as legal advice. The information of this web site is of a general nature and may not be applicable in some situations and jurisdicitions. You should neither take any actions nor refrain from any actions based on this general information. Accessing the information of this web site or sending electronic mail (email) to The Gottfried Firm does not create an attorney-client relationship with The Gottfried Firm, nor with any attorneys affiliated with The Gottfried Firm. You should be aware that correspondence (including electronic mail) received from non-clients may not be privileged information and may be disclosed to others.